Purchase order management software provides simple graphical user interface and ready-to-use PO organizer solution for all types of small and big organization. PO management program store entire company record and other related information regarding its vendor, supplier, distributer, seller and many more. Software automatic remove duplicate entry, update previously saved record and facilitate accounting staff to easily add new entry or modify any saved record. Cost effective PO organizer software support all different Microsoft windows operating system including 98, 2000, 2003 server, NT, ME, XP professional, media center and all VISTA editions. Download free demo version of application to aware with software working and functionality and contain inbuilt help manual. Application provide complete install and uninstall support and easily used by any non technical user. Purchase order organizer tool retain sold, purchased or returned product record and generate all types of financial report like purchase order report, purchase delivery report, sales report, invoice report, order report, receipt report etc and facilitate to print it on paper or send at user specific email address. 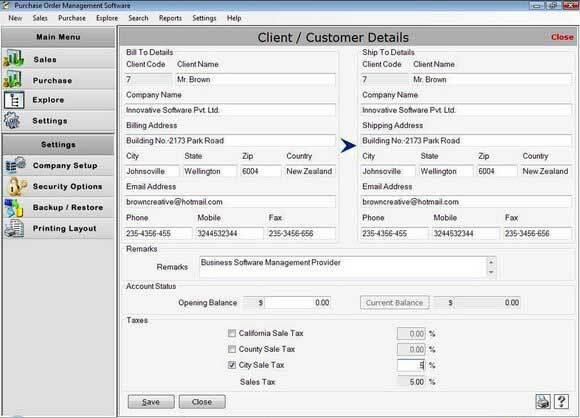 * PO management software record and maintain entire financial transaction of company. * Record customer, vendor details and sales, purchased and returned product information. * Create various types of sales / purchase report and allow printing them on paper or email at specified address. * Automatic updates previous saved entries and eliminates duplicate entries. * Avoid unauthorized data modification due to its password protected features. * Easily run with all Microsoft windows operating system including Vista with laptop or desktop computer.